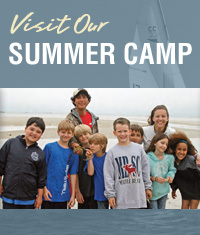 Situated just 90 miles from Boston, 35 miles from Provincetown, and 20 miles from Hyannis, Cape Cod Sea Camps provides a central location for easy access to many of the area’s natural attractions. From the Sagamore Bridge, take Route 6 East to exit 12. Take Route 6A for approximately 2-1/2 miles. Go past Nickerson State Park on the left and Linnell Landing Road on your right. Soon you’ll see our fields and sign on your right. Turn right into our driveway at the far end of the field.